It’s no secret that I’m a real spring and summer lover – I hate, hate, HATE the winter months, and spend the whole time hibernating with books and moaning about the rain. I mean, I love knitwear as much as the next person, but it’s hard to have fun with clothes when everything is hidden under a coat! 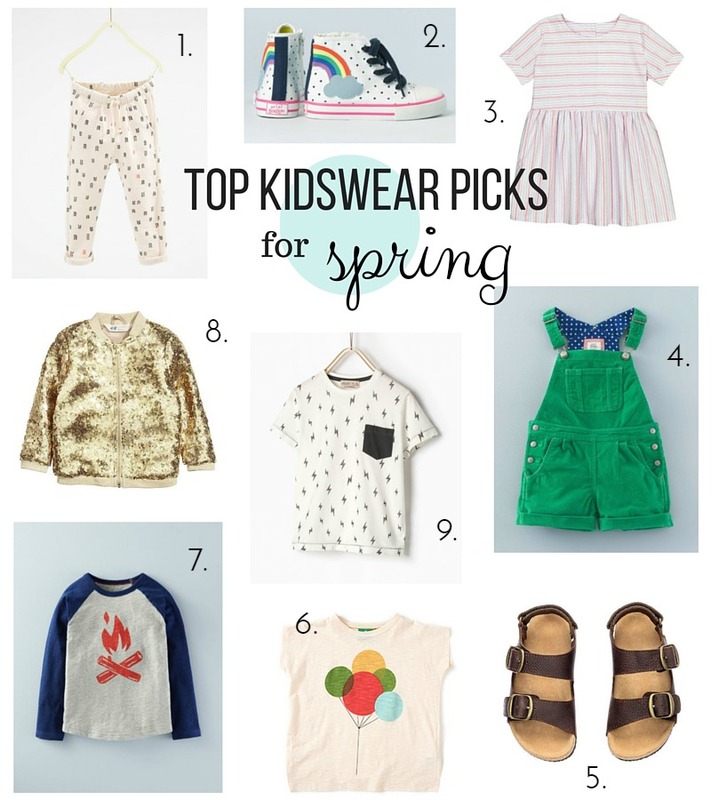 Spring and summer are sooooo good for kidswear – dungarees, shorts, cool sandals and sneakers, printed t-shirts and LOADS of accessories. Today I’ve rounded up my latest favourite finds for the little people in your life. We’ve had these from Zara before, and they’re such good quality – and the style means that when they get a bit short, they work well as cropped trousers as well! They’re high tops with polka dots and rainbows – what’s not to love?! I love Tootsa MacGinty for their age appropriateness, their gender-free approach to design and the fact that the quality is so good that everything lasts for ages. They’re pricier than the high street, but well worth it – we head there for birthday presents and special occasions. I love dungarees (I’ve just bought my first pair! Bit late to the party, as usual…. ), and if they made these in my size, I’d totally wear them in the summer. I’ve not seen these in store, but they caught my eye online last week – I love that they’ve got that whole Birkenstock style thing going on, but at a fraction of the price! Little Green Radicals are another one of my favourite online brands – again a bit more pricey, but they’re completely organic and earth friendly, and the designs are always beautiful. Another one for birthdays! We actually bought this for Daisy, and so far it’s worn pretty well – no missing sequins (although there are so many you might actually not notice!) and it’s still as bright and sparkly as the day we got it. I love Zara for clothes, and often buy from the boys section for Daisy – they’re a high street shop and not too expensive, but they have an excellent environmental and social policy, so I’m quite happy to hand my money over!